One of the audience was asking about big power twinkle light flasher with a voltage of 220 VAC. So in this article I explain about modification of the previous flasher circuit for greater power up to 2,200 watts, or 2.2 kilowatts. Read also: simple LED decorative lamp, only 3 components, no soldering. Read also: easy motorbike science toy by popsicle stick, it runs fast. There are two types of flasher discussed in this article, namely SIMPLE FLASHER and FLASHER WITH SCR. 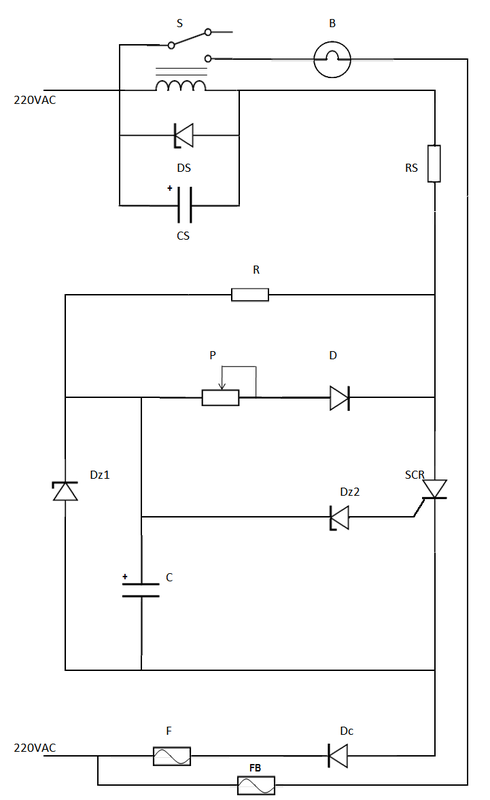 Before discussing a more complicated schematic, it is better if we discuss first about the simple flasher circuit which consists of 5 components beside the lamp, as the following schematic. The following YouTube videos show when the circuit is tested with Philips 100 watts 220VAC bulbs. 2x (two) bulbs are connected to Normally Close (NC) and Normally Open (NO) pins so that those bulbs turn on and off alternately (flip flop). DR = rectifier diode 1N4007, which converts alternating current (AC) to direct current (DC) to be supplied to relay coil. S = relay with 24 volts coil voltage, and current of 10 amperes at 250 VAC, so it can turn on 2200 watts bulbs at a voltage of 220 VAC. I am using 'MASSUSE' relay switch with type 'ME-15H'. From the test results with digital ampere meter and volt meter, it has been known that relay can be activated (On) with coil voltages as low as 15 volts and current of 10 milliamperes (0.010 A). This relay has 5 pins with SPDT ( Single Pole Double Throw ) type, therefore the current can flow when the coil is off, and also current can flow through different pin when coil is activated. With the SPDT relay this simple circuit can be used to control two lights that flash alternately (flip flop). See photo of relay below. B is lamp and connected to relay pin, so that it will turn on when the relay is activated. When relay is activated, the relay coil is not supplied by 220 VAC grid, but relay coil is supplied by condenser CS. When condenser is empty then the relay will be turned off so the lamp B also turned of. When relay is not activated (Off), the relay connects 220 VAC grid to condenser to recharge it, so then the cycle continues. 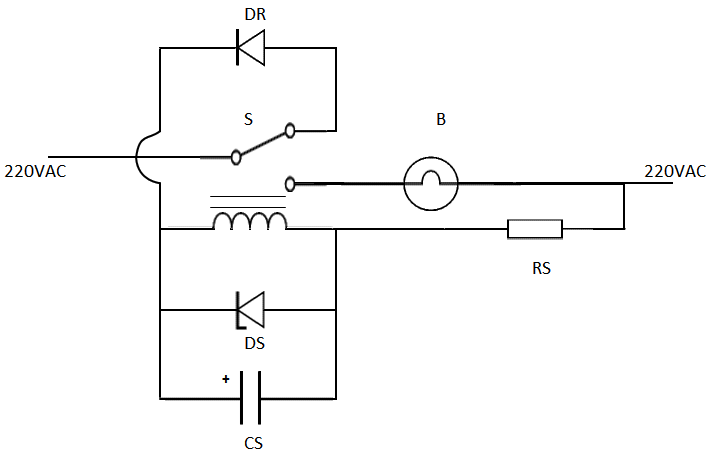 That is why that relay must have two pins for current direction (SPDT). If using automotive relay, up to 30 amps current can be transmitted, so a load with power around 6,600 watts can be connected. But automotive relay is rather difficult to be mounted on to PCB (Printed Circuit Board), because its connectors are big. Automotive relays are usually expensive, and mostly they are Single Pole Single Throw (SPST) type, with only one position for current flow, instead of double position like SPDT. Automotive relay coil also consumes relatively large current and thus require a resistor for coil (RS) with greater power and more expensive. That is why I choose 'MASSUSE' relay when designing this circuit. DS = 24 volts zener diode with a power of about 1 watt, this zener limits the voltage at relay coil to only as high as 24 volts. Also this zener will short high voltage (spike) which reaches thousands of volts as produced by induction of the relay, when its coil turns to off right after activated. Although spike is happened in a very short time and with a very weak current, spike can cause fatal damage to other components, such as SCR, transistor, IC, and others. We can see in the above photo zener diode has light blue colour. Note that zener diode pins installation is in reverse direction of a conventional diode and SCR . RS = 5,600 ohms resistor (5K6) with 5 watts power. This resistor limits current supplied to relay coil. With the value of 5K6 will reduce voltage on the relay coil to about 25-26 volts. That voltage (25-26 volts) will be stabilized by the zener diode DS to 24 volts maximum. This resistor should be large because the power is supplied by 220 VAC from grid. Small power resistor will be overheating. If you are using a relay with different current consumption for its coil, then this RS resistor should be adjusted. If you need a relay with greater current consumption, then the RS should be lower with increased rated power. Vice versa, if you need a relay with smaller current to activate its coil, then the RS resistance value is increased and wattage may be lowered. So in this circuit design, a low voltage relay coil can work safely although supplied by a high voltage grid, because the coil is protected by resistor (RS) and zener diode (DS). CS = 100 microfarads condenser with a maximum voltage of 50 volts. Condenser or capacitor in this simple flasher circuit serves as an accumulator or a battery to activate coil relay. This condenser will determine twinkle frequency. From the test results a value of 100 microfarads will make about 3 hertzs twinkle frequency, or 3 flashes per second. When using 470 microfarads condenser then twinkle frequency is about 3/5 hertzs or 3 flashes every 5 seconds. Positive pin of condenser is connected to diode (DR), negative pin of condenser is connected to resistor (RS). In the photo above condenser CS is coated with dark blue plastic. This simple flasher circuit is easy and cheap to be assembled, but unfortunately it is difficult to tune twinkling frequency. As it needs to replace condenser (CS) to set the frequency. If using a relay that has a 220 volts coil voltage then the circuit will be much simpler, but it is usually expensive. Click here to see a video of a homemade science toy submarine in action. The submarine can dives, hovers, re-surfaces and moves forward, without battery / electric power. 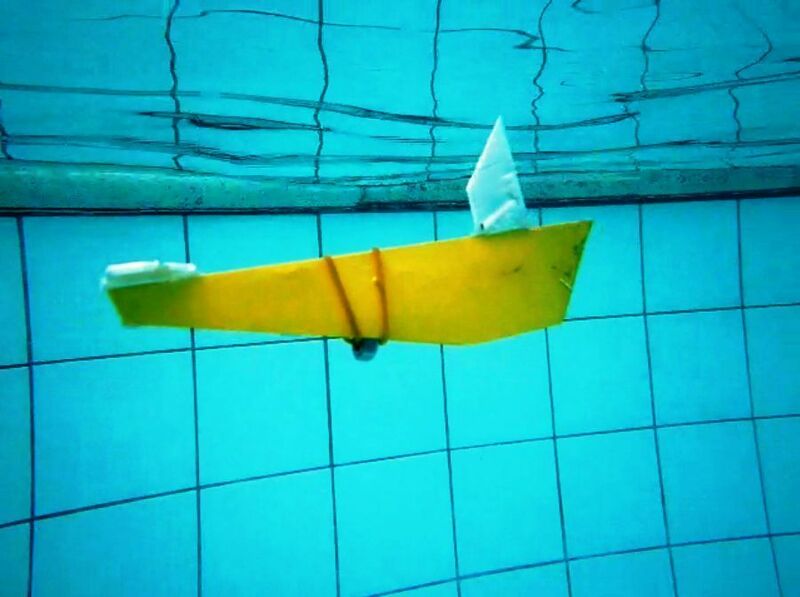 The submarine is made of household items such as: plastic sheet, polystyrene, rubber band, nut. Those items are usually wasted, useless, and become pollution. But now we can make a beautiful working submarine with those materials. This submarine or U-boat and can be played safely in a bucket of water, bathtub, swimming pool, etc..
Now let's put the relay in series with SCR which is discussed in the article "Adjustable Twinkle Light 200 Watts 220 VAC Schematic". Please concentrate to the top of the above electronic circuit schematic, some of the components are already described and they are same with simple flasher components described at the beginning of this article . CS = 4.7 microfarads condenser with a maximum voltage of 50 volts, this condenser is different to condenser on simple flasher circuit. On this circuit, this condenser does not set twinkle frequency. Condenser in this circuit stabilizes current flow to activate the relay coil so the relay does not vibrate excessively at 50-60 hertz, because it must be activated (On) steadily. As we know the relay coil is activated by an alternating current (VAC) 50-60 hertz which is rectified by the diode, so the direct current produced is in half-wave pulse that can make relay vibration. From the test results, condenser value of 4.7 microfarads is sufficient to stabilize the relay when activated, the biggest value that I've tried was about 22 microfarads. If using too big condenser, then the relay will always activated or always On, even when the SCR has been turned off to cut the current to turn off lamp. Condenser positive and negative pins must be installed properly. Positive condenser pin is connected to the 220 VAC power grid, the negative pin is connected to resistor (RS). Note how to connect relay to lamp or light bulb and to power source. One of lamp wire is connected to relay output pin, other relay pin is connected directly to the power grid 220 VAC. Lamp is protected by a fuse (FB). Lamp fuse (FB) is big and must be in accordance with ligh bulb current. The other fuse (F) only protects low-power components, does not protect the lamp, so only use a small current fuse about 0.5 amperes. Thus if there is a failure in the circuit, the fuse can be broken off immediately to prevent further damage, or even fatal accident. As the relay is SPDT type, so we can arrange 2 lamps to form flip-flop twinkle light, those two lamps turn On and turn Off alternately. See below schematic of relay wiring. Each of those two lamps of flip-flop arrangement is connected to different relay output pin. So the relay will supply current to those two lamps alternately. Total lamps power for flip-flop arrangement should be reduced to about 1/4 maximum power of relay capability, or about 500 watts. Because relay contact points have a little time to rest to reduce its temperature. The values ​​of some other components and how to set twinkling frequency can be read in the article "Adjustable Twinkle Light 200 Watts 220 VAC Schematic". CAUTION: The entire circuit is connected directly to the high voltage grid, do not touch the circuit when connected to the power grid, use only well insulated equipment and tooling.